KOUNTZE, Texas — A Texas state appeals court has upheld the right of high school cheerleaders to display Bible banners at sporting events, but stated that because the school district has since changed its policy to likewise allow the banners, the lawsuit surrounding the matter is now moot. 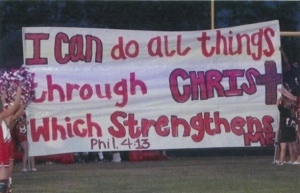 As previously reported, public school cheerleaders in the tiny east Texas community of Kountze has been fighting since 2012 for the right to display banners with inspirational Bible verses at sporting events. Following a complaint from the Freedom from Religion Foundation, school officials had ordered the cheerleaders to stop including Scriptures on their signs. However, the Liberty Institute—a religious rights organization—then legally challenged the school’s action, and in May of last year, a Texas judge ruled that the banner displays were constitutional. But as the Kountze Independent School District (ISD) appealed the decision, the case soon made its way to Texas’ Ninth District Court of Appeals. On Thursday, while upholding the cheerleader’s right to display the banners, the court ruled that the case is now moot because the district had since altered its policy. “Not only has Kountze ISD formally adopted a new policy since the initiation of the underlying lawsuit, it has made judicial admissions in the pending litigation to affirm its new policy and its future intentions regarding religious content on the run-through banners,” Justice Charles Kreger wrote on behalf of the three-judge panel. Kountze ISD Superintendent J. Reese Briggs applauded the decision, stating that the he believes the controversy is over. But Kelly Shackelford, president and CEO of the Liberty Institute, said that while he was glad that the rights of Kountze cheerleaders are protected, he wished the ruling would have extended further.